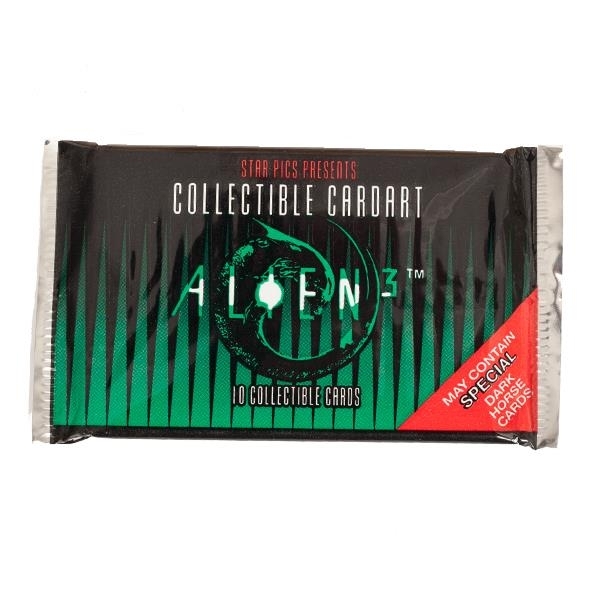 One vintage pack of Alien3 trading cards. Produced by Star Pics, (in cooperation with Dark Horse Comics), in 1992, these cards featured stills and production photos of the film on the front and dialogue excerpts, character info and movie facts on the back. There were 80 cards in the base set and a chase sub-set of 9 cards featuring awesome artwork from the Dark Horse Comics Alien titles. These card packs are still factory-sealed from 1992 so you never know which ones you'll get - so buy a few!